We offer a wide range of Nazi WW II Occupation and Axis Stamps, Sets and Souvenir Sheets. We list more than 200 different sets and singles of countries occupied by the Axis powers as well as wartime stamps issued by other Axis countries and Danzig. Take a look at the Feldpost and Propaganda section to see stamps for military use and propaganda stamps made by wartime countries. VF NH. 1945 Post WW II remainders of Nazi Adolph Hitler postage overprinted with Osterreich. Scarcity of paper led to overprinting of existing stocks of stamps. FVF NH, 1945 issue for use in Occupied Austria. Overprinted Third Reich stamps used as a temporary measure. Overprinted with Osterreich and new values. VF LH, 1939 Set showing City Views, Prague, Marish-Ostrau, Zlin. 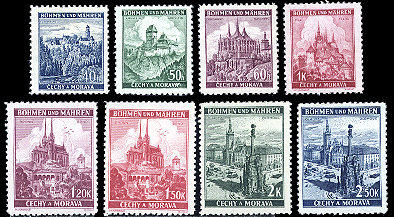 VF used, 1939 Set showing City Views, Prague, Marish-Ostrau Zlin. VF NH, 1941 Issue for the Prague Fair showing Farming and Manufacturing. Bohemia & Moravia B1-2, Red Cross-Tabs! VF used, Red Cross Issue With Labels! Pair oriented vertically. Label on top or bottom. VF NH 1941 Red Cross Issue with Tabs! VF LH 1941 Red Cross Issue with Tabs!